I found several VMs with the primary disk in VMDK format, followed by a second disk (dedicated to the applications, mainly databases, app servers or mail) in physical RDM format. Since a part of the project is to have a complete data protection solution completely based on VMware VADP libraries, we suggested the customer to convert all the RDM disks into VMDK disks. 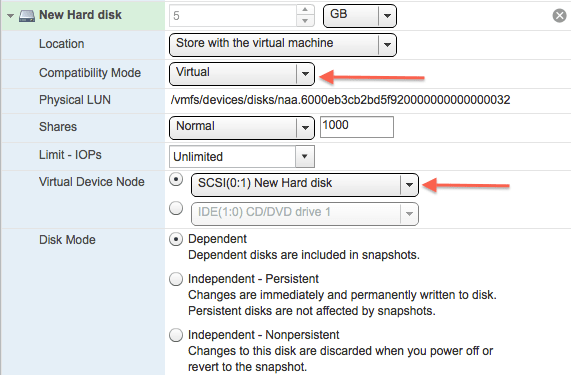 With the latest vSphere releases, there are really no performance differences to justify RDM disks if not for Microsoft clusters or other situations requiring shared disks between VMs, while in the contrary it’s not possible to take snapshots of physical RDM disks, thus preventing backups of those disks and forcing to use backup agents inside the Guest OS. To validate the procedure, and to reassure the customer, I realized a quick test to show the conversion process. 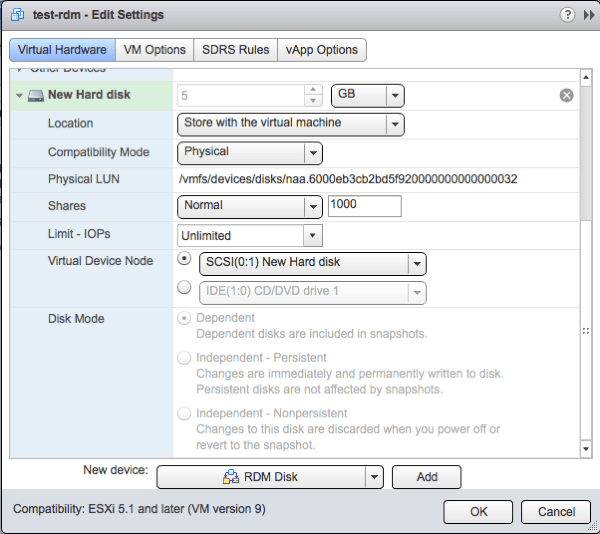 This task can only be done once the infrastructure is upgraded at least to vSphere 4, since (based on KB1005241) a storage vmotion on ESX 3.5 of a virtual RDM does not convert it to VMDK, while this is possible with vSphere 4.0 or newer versions. To complete the conversion, the VM must be shut down at least once, so you need to schedule the activity with the customer. Once the VM is stopped, you need to edit its settings and remove the RDM disk. Write down the Virtual Device Node (0:1 in my example), because later you will have to reconnect the disk with the same value. Select the option “Deletes files from datastore”. Don’t be scared: since it’s a physical RDM, the only thing that will be deleted is the pointer to the RDM disk, not the disk itself. This time, choose “virtual” competibility mode, and select the same device node value as before. This let the Guest OS think the disk is the same as before.